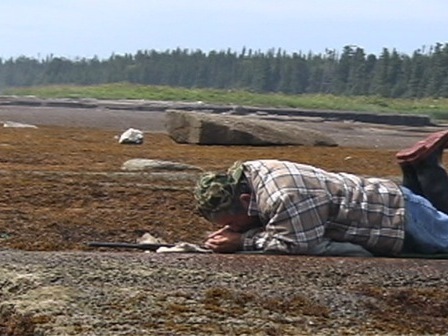 Innu hunters were also well acquainted with marine animals, since they spent all their summers by the sea. Abraham Bellefleur, from Ekuanitshit, demonstrates his knowledge of catching seals. 2:04 min. - Before returning to the bush in August, we hunted seal for its fat and hide. Women - No, we don't need a man... You're lucky you can still sit like that. I'm not just good at filing, I also know how to take care of men. I think we're going to need a man... after all. Very interesting...is there still seal hunting in that region nowaday?